Love is portrayed in many different ways in videogames. In epic Japanese RPGs, love stories are told in dramatic cutscenes, accompanied by a rousing music score and an air of slight confusion as to what is really going on. In other games, love is simply just a matter of saving the princess from a far away castle. While love is prominently featured in games, it is rare for the digital passion between two on-screen characters to really connect with the person playing the game. It happens (says the tears that welled up in my eyes at the end of Shadow of the Colossus), but when is the last time you can remember being truly moved by a love story being told in a videogame? Sometimes the most moving of moments can pop up in the least likely of places. Never more has this been true then when I played through the very recent Professor Layton and the Diabolical Box for the Nintendo DS. Who knew that in this completely fantastical puzzle game I would experience one of the most moving and beautifully told love stories I have experienced in recent memory? Hit the jump to witness a wonderful tale of timeless love and tragic loss under the oddest of circumstances. Be warned, though: MASSIVE SPOILERS FOR PROFESSOR LAYTON AND THE DIABOLICAL BOX ARE AHEAD! Seriously, the biggest mystery of the game is revealed and I really don’t want to be responsible for spoiling this masterpiece of a game. Professor Layton and the Diabolical Box is the recently released sequel to Professor Layton and the Curious Village, the hit Nintendo DS game. Like the first game, Diabolical Box is an exquisitely presented classic point-and-click adventure game featuring a series of mind-bending puzzle challenges. While it sounds strange, the combination of the heavy story of an adventure game with the solving of seemingly random puzzles works perfectly and really makes the Layton games unique, completely rewarding experiences -- some of the best games the DS has to offer! In the game, you play as classic character Professor Layton and his young assistant Luke, alternating control between the two depending on what the circumstances call for. The story of Diabolical Box pretty much continues exactly where the last game left off. As the game begins, Professor Layton and Luke have just finished solving the mystery of the Curious Village when they are summoned to visit Layton’s mentor regarding a strange discovery he made. When Professor Layton and Luke arrive at the mentor’s house, he is found dead in his office! The only hint of what happened lies in the final notes made by the mentor. In his notes, he mentions a strange object called the Elysian Box that may or may not kill anyone that opens it. 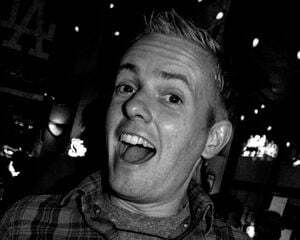 Unfortunately, the box was stolen from the mentor’s office after he was killed, and the only information of its whereabouts lie in the Molentary Express, a passenger train also mentioned in the mentor’s cryptic notes. 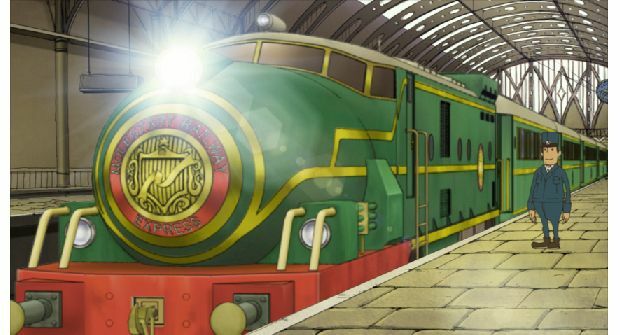 After traveling on the train for many miles -- and visiting a few places along the way -- Professor Layton and Luke eventually make it to the mysterious, dreary town of Folsense. To say Folsense is strange is putting it mildly. When the Professor and Luke first get off the train, they notice the station is almost in ruins, like it has been unkempt for at least half a century. As the two wander through the dilapidated building they see pictures on the wall portraying a beautiful, vibrant village, full of lights and life. Layton and Luke immediately deduce these are photographs of what Folsense used to look like, before it started to fall apart. 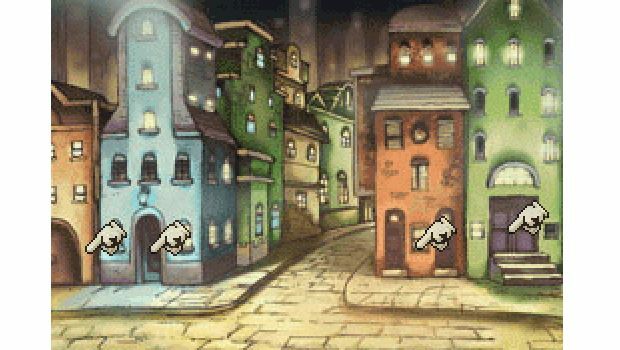 To their shock and amazement, however, when Professor Layton and Luke leave the station and enter the center of town, their surroundings seem to change right before their very eyes! The rundown station they just walked through appears brand new again, and the once darkened town is filled with numerous lights and a palette of various colors. Confused, Layton and Luke continue through the village to figure out what the heck is going on. Eventually, the two crime solvers learn that Folsense was once run by a powerful, affluent family: the Herzens. Lord Herzen ran the town 50 years ago, which became a haven of wealth once a massive deposit of gold was discovered under the once peaceful village. During all the chaos formed once the town was, literally, torn apart with people digging for gold, one of the Lord’s two sons, Anton, was separated from the love of his life, a beautiful girl named Sophia. Due to an unfortunate misunderstanding, Sophia left the town and never returned to be reunited with her love Anton, causing Anton to become severely depressed, locking himself in Herzen Castle and causing the denizens of Folsense to think he is a vampire. After enlisting the help of a mysterious girl named Katia, Professor Layton and Luke eventually make their way into Herzen Castle and confront Anton about what has been going on. 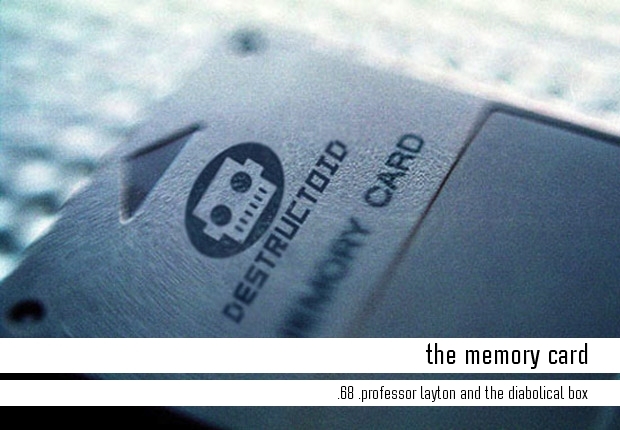 It is at this moment when this week’s Memory Card moment occurs: Anton’s love story. When Layton and Luke finally meet up with the supposed “vampire,” they are immediately shocked that Anton looks exactly the same as he did in photos from 50 years ago. 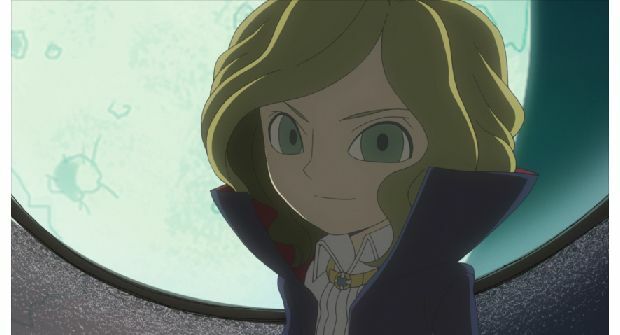 On top of that, Anton is none too happy about seeing people trespassing in his castle and challenges Layton to a duel! The duel involves a test of wits, which, of course, the Professor wins. Once defeated, Anton collapses to his knees, out of breath and exhausted. He looks up and sees Katia, and his demeanor completely changes. A look of sheer shock covers his face. Anton stands up and slowly walks towards a morose Katia, muttering the name “Sophia” over and over again. Layton and Luke immediately realize that Anton thinks Katia is his long lost love, Sophia. Before he has a chance to get too close, Katia steps forward and tells Anton that she knows a secret. She traveled all the way to Folsense to find him and let him know the truth after all these years. “I’m your granddaughter, Anton,” Katia whispers to a stunned Anton. At this point Katia and Layton explain to Anton and a confused Luke what has been going on this whole time. 50 years previously, when everyone began digging furiously to find gold, a toxic gas was released into the town of Folsense. Because of this, many people started to get sick, some even dying from the poisonous fumes. Instead of staying with Anton in the dangerous town, Sophia left him. But it wasn’t for the reason Anton thought. You see, Sophia told Anton she was leaving because “there’s someone else I love who needs me even more than you.” Anton, understandably, thinks Sophia is betraying him, but what she was really referring to was the baby in her belly. Sophia was pregnant and, not wanting the baby to be hurt by the poisonous gas, leaves Anton in the hopes to return someday with their new child. Sadly, that day never came. Sophia got sick and never had a chance to return to the man she loved. When Anton hears the truth he is shocked and angered that his beloved Sophia died so many years ago. In an attempt to help him understand the truth even more, Layton steps forward to tell Anton that Folsense is not what it appears. The poisonous gas that was released on the town years ago makes everyone that enters the town think it still looks like it did 50 years ago. The entire town is an illusion caused by the effect of the lethal fumes. Anton, refusing to believe everything he is hearing, angrily charges towards Layton. 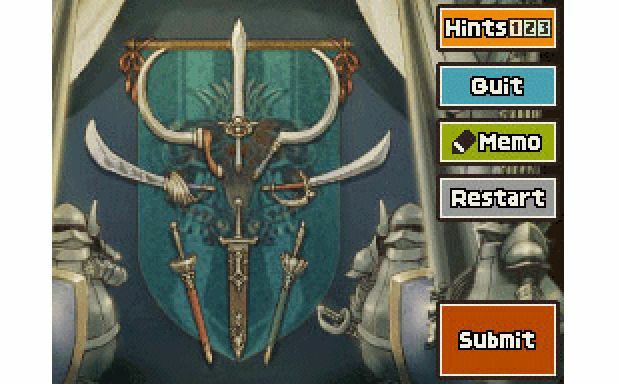 He swings his sword, but instead of hitting the Professor, the sharp blade strikes a rope holding up the massive chandelier hanging over the castle’s lobby. The giant chandelier crashes to the ground, barely missing Layton and the others. The castle, already structurally weak because of all the gold digging that has weakened its foundation, immediately begins to collapse. Barely making it out with their lives, Layton, Luke, Katia, and Anton escape the crumbling castle. Once outside, Layton, Luke, and Katia are shocked by what they see. Because the collapsing castle sealed the area releasing the gas, everything in Folsense magically changes to what it has really become after all these years. Right before their eyes, the bright, vibrant village turns into a collection of dark, ruined buildings. Even Anton’s true self is revealed: that of an old, frail man. He had been old all along, but the hallucinogenic gas was making everyone see him as the young man of 50 years ago. Anton’s wrinkled, trembling hands reach out and touch his weathered face. Once he realizes exactly that has happened to his body, to his village, Anton forgives Layton and Luke for his sudden, violent outburst. He then proceeds to tell them the true secret of the Elysian Box. Anton reveals that the Elysian Box was used to transport a love letter to his dear Sophia after she had left town -- the letter lies hidden inside a secret compartment on the bottom of the container. 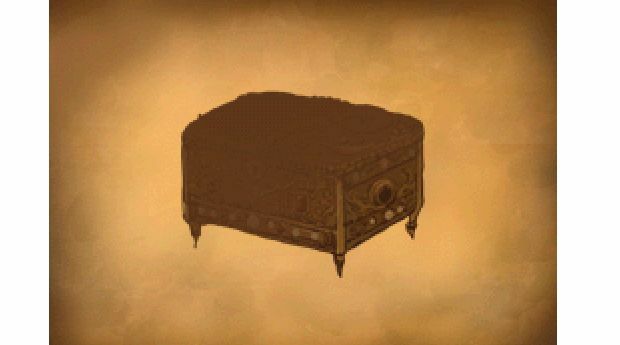 After solving the box’s puzzle, Professor Layton reads the faded letter. To his (and everyone’s) surprise, the letter is not written by Anton at all. In the hidden compartment is a letter written by Sophia! Even though Anton feared she had received and ignored the letter in the Elysian Box all those years ago, that was not the case at all! She had received the letter and she actually wrote back! It was her letter that never reached Anton, its intended recipient! "My dear Anton, are you well? I received your letter. Though I’d like nothing more than to see you again, I’m afraid I no longer have the strength to do so. You don’t know how many times I’ve thought about you over the years. I often wonder if you hate me for what I did. Do you?" "When I decided to leave I was carrying our child. I couldn’t bear exposing that tiny life to such danger. I knew your father’s position and understood you didn’t have the option to leave with me. Even though I did the only thing I could, I’ll always regret leaving you that way." "But there’s one bright spot in this sad story, and that is our lovely granddaughter, Katia. My departure all those years ago has given you the chance to meet. Katia’s mother died shortly after she was born, but Katia grew up strong and sweet just the same. She reminds me of you every time she smiles. With her around, I could never forget about you, even if I wanted to. You’ve been in my thoughts since the day we parted. And now, though my time here is drawing to a close, I like to think we’ll meet again on the other side." Lowering the letter, Anton’s eyes fill with tears of joy and sadness. He wraps his arms around Katia and hugs her more than any person he has ever embraced before. With that, Professor Layton and Luke leave the newly reunited grandfather and granddaughter alone as they return to the Molentary Express. As Layton enters the old train station, he looks back and sees Anton and Katia staring into the beautifully lit sky, the memories of their beloved Sophia at last bringing them together. Reading it back, this is all a lot of information to take in, and, honestly, the entire thing hedges on the side of being a tad bit absurd. But that is what makes the love story resolution so surprisingly moving. The fact that I could relate to something so odd and completely over-the-top makes the ending of Diabolical Box that much more impressive. Obviously I have never fallen in love with someone that has left me in a ghostly village taken over by a strange gas that makes me hallucinate into thinking it is 50 years earlier. And, I would bet that none of you reading this have gone through that either. So, how, then, can a scene so ridiculous touch me as much as it does? The answer to that comes down to three main factors. Secondly, the universal theme of unrequited love is easy to relate to, regardless of the crazy circumstances that accompany it. Looking past all the crazy plot twists and settings, Diabolical Box is about two people in love that can’t be together -- simple as that. We can all relate to that! While the story may be complicated, this basic underlying theme is remarkably touching. Lastly, but most importantly, the entire sequence works because of how everything is presented. 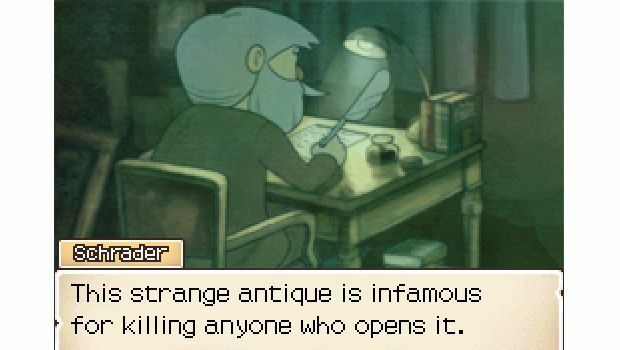 In the first Professor Layton game (Curious Village), the final plot twist was more about the shock and mystery of it all rather than the way it would connect to the person playing. So, going into the sequel, I expected more of the same. Even playing right up to the end -- with all the talk of vampires, castles, and murders -- I expected the ending of Diabolical Box to be similar to the first game. Once I found out everything came back to the story of these two seemingly random people in love I was surprised and ultimately moved. It was a touching resolution to a game that had me guessing throughout. I look back at every beat of the final sequence and everything falls into place perfectly. The moment Anton reveals himself is intimidating and slightly terrifying. The news of Katia's true indentity is both shocking and sad. The battle between Anton and Layton is tense and suspenseful. But after all this, the game really tugs at your heartstrings with the beautiful realizations of what the town, and Anton, truly look like. The way the gorgeous cutscenes reveals these truths is very elegant. I am not ashamed to say that I was more moved by the love story in Diabolical Box than any other love story in any medium I have seen all year. Seeing Anton as an old man and witnessing the exact moment he realizes his true love is gone breaks my heart. But then seeing that same man embrace the love of his new granddaughter fills my same breaking heart with a genuine joy. From the moment the letter from Sophia is read until the very end of the game I was completely lost in the tragically beautiful story. The game really has a lot to say about love, loss, and what is really important in life. In a world of such cynicism and negativity, it is wonderful to see a videogame end on such a whimsical, moving, refreshingly mature note. And, again, keep in mind this is all coming from a Nintendo DS game. The ending of Professor Layton and the Diabolical Box is a really special creation. 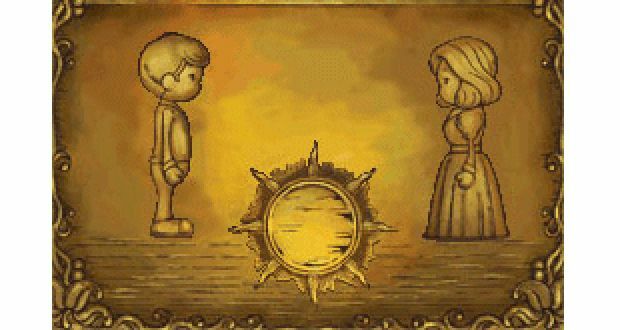 It is easily one of my favorite videogame endings of all time, and a truly satisfying, touching resolution to one of the most surprising love stories of this generation.